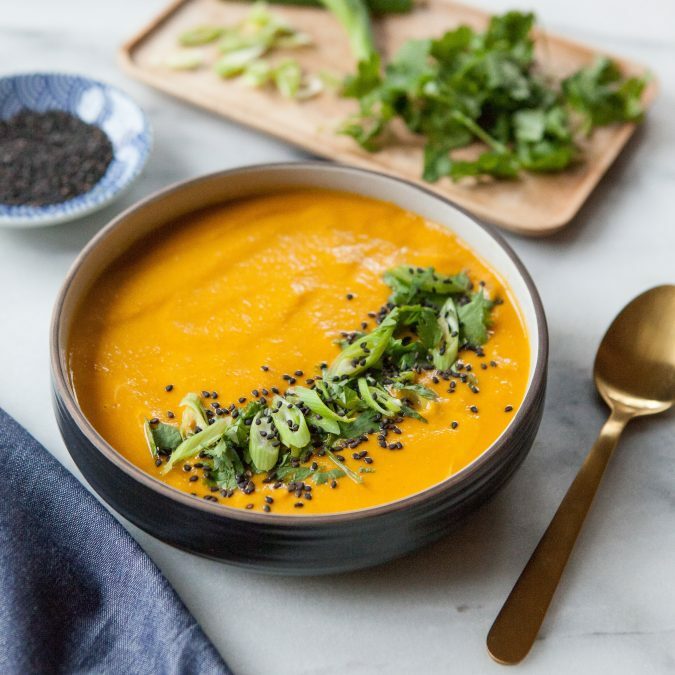 A velvetty, smooth and creamy carrot and cauliflower soup with Thai flavors and vibrant toppings. I like my soup a little spicier, and often add up to 3 tablespoons of curry paste, so taste and adjust your seasoning and level of spice as desired. Similarly, if you really crave heat, feel free to throw another jalapeno in there (and also feel free to go totally without – it’s just as good). In a large soup pot, warm the olive oil over medium heat. Add the onion and cook down for 5-6 minutes, or until it’s soft and translucent. Add the ginger, garlic, jalapeno, and lemongrass and cook for an additional 2 minutes, or until fragrant. Stir in the curry paste. Add the carrots, cauliflower, broth, coconut milk and salt and stir well. Bring the soup to a slow boil over medium-high heat, then reduce the heat to low and simmer, covered, for 35-40 minutes, or until the carrots and cauliflower are tender.